Aloha everyone! 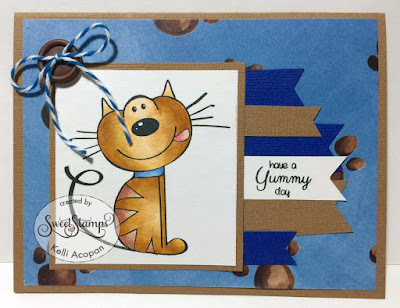 kel from Scraps & photoGRAFFS here today sharing my first project as a DT Sweetie! I'm so honored to be here and working with such a wonderful and talented team! I used the cute kitty and one of the sentiments from the Kitty Sweets Clear Stamps Set... He's so cute I couldn't resist!! I colored him up with copics and added the sentiment to the side along with some fun banners to match. I even added some Glastique Finishing Glaze to his nose to shine it up a bit, although it's not so shiny in this picture! This is so cute and beautifully colored. Love the added button and twine. Adorable! Love the coloring and banners!